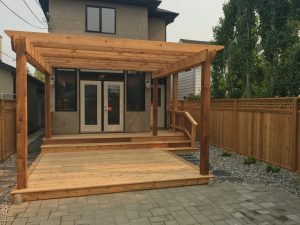 What is the best deck material to use in Calgary? There are several options for materials when it comes to building your deck. Calgary has some extreme weather that can go from very cold to very warm. This extreme weather can be hard on decks so choosing the right material is very important. 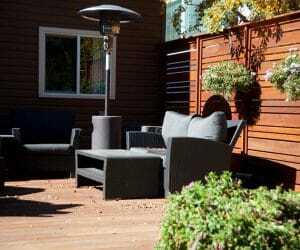 Pressure treated wood is the least expensive option when it comes to deck material in Calgary. Pressure treated wood can withstand Calgary’s extreme weather quite well and the smooth surface of pressure treated wood allows you to shovel it easily. Pressure treated wood can be left without painting or staining but you can also choose to paint or stain it if you like. 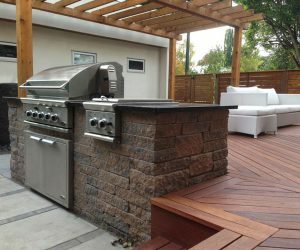 Pressure treated wood is quite a common material used on Calgary decks. Cedar wood decking is a very attractive option to use for your deck material. It’s beautiful, natural wood tones are enriched when you add a semi transparent stain. The stain really brings out the wood grain so it is highly recommended to use the stain both for appearance and to protect your deck. If you choose to use cedar wood decking you will need to stain it once each season. This can be a lengthy process so some of our clients choose to go with a composite deck material so they do not need to worry about annual maintenance. Cedar decking is more costly thanpressure treated wood but if you don’t mind having to stain it then it is well worth it. beat. Many of our clients choose this decking material because it last for a very long time and is very resistant to Calgary’s ever changing climates. Meranti hardwood has a dark brownish red colour that is typically darker than cedar. Meranti hardwood decking does cost more than cedar or pressure treated and labour costs to install the decking are also higher. This type of decking can be left raw without stain but it will turn to a faded grey colour after a few seasons. Meranti is much more attractive if you protect it with a stain that brings out the amazing wood tones. Composite decking is becoming more and more popular for use as a deck material. Composite decking used to be less reliable because it was made of recycled material. Most quality composite decking is now made with virgin material so that means it is less likely to warp or fade. Composite decking can still fade over the long term and its rich wood like tones may not be as realistic after several years. Composite decking can be hot to walk on as it absorbs the heat. 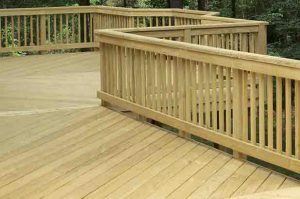 There are very many great options for composite decking now and many of the higher end decking products look identical to wood. Composite decking is one of your more costly deck options but with zero maintenance many of our clients choose it over natural wood.